Kenidjack valley is one of the mines which has been improved. The future of one of the most important historic mining areas in the country is being celebrated on Monday. The National Trust has announced the completion of a 10-year project to secure the long term future for St Just in west Cornwall. It is now one of the key sites in the Cornwall and West Devon Mining Landscape World Heritage Site bid. The project has ensured the survival of over 70 industrial sites, including two of the country's best known mines. In all an estimated 2,000 surviving shafts and 13 surviving engine houses have been saved. 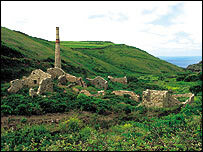 The trust said the Cornish mining industry made a key contribution to the evolution of an advanced industrial economy and society in Britain between 1700 and 1934. The St Just mining district was one of the richest, most important mining areas in Cornwall. Mark Harold, National Trust regional director for Devon and Cornwall, said: "The completion of the St Just coast project is a significant milestone in the ongoing conservation of Cornwall and West Devon's celebrated industrial landscape. "This celebration is an opportunity for us to say thank you to everyone who has made this project possible, but also to highlight how working in partnership to protect our cultural heritage can regenerate the countryside and support local communities." The trust said the St Just Coast Project could not have been achieved without significant funding and building firm partnerships with the local community and organisations including Cornwall County Council, the South West Regional Development Agency, English Heritage, Objective One and the Heritage Lottery Fund. Nigel Sumpter, principal project officer for the St Just Heritage Area Regeneration Project, said: "As part of the project, for the first time in its history the world's best preserved arsenic works, near the famous Crowns engine houses at Botallack, can be safely entered."